Gingival overgrowth occurs mainly as a result of certain anti-seizure, immunosuppressive, or antihypertensive drug therapies. Excess gingival tissues impede oral function and are disfiguring. Effective oral hygiene is compromised in the presence of gingival overgrowth, and it is now recognized that this may have negative implications for the systemic health of affected patients. Recent studies indicate that cytokine balances are abnormal in drug-induced forms of gingival overgrowth. Data supporting molecular and cellular characteristics that distinguish different forms of gingival overgrowth are summarized, and aspects of gingival fibroblast extracellular matrix metabolism that are unique to gingival tissues and cells are reviewed. Abnormal cytokine balances derived principally from lymphocytes and macrophages, and unique aspects of gingival extracellular matrix metabolism, are elements of a working model presented to facilitate our gaining a better understanding of mechanisms and of the tissue specificity of gingival overgrowth. Clinically detectable fibrotic overgrowth of gingiva is caused by a variety of etiological factors and is exacerbated by local bacterial plaque accumulation. 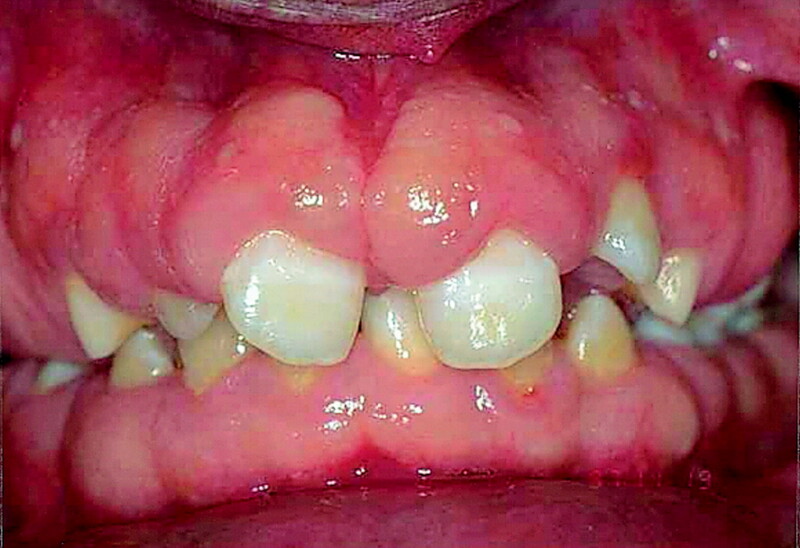 Gingival overgrowth can be inherited (hereditary gingival fibromatosis), or is of idiopathic origin, or is sometimes associated with other systemic diseases. The majority of cases, however, occur as a side-effect of systemic medications. These medications include the anti-seizure drug phenytoin, the immune suppressor cyclosporin A, and certain anti-hypertensive dihydropyridine calcium-channel-blockers, most notably nifedipine. There is now general agreement that gingival overgrowth lesions all contain fibrotic or expanded connective tissues with various levels of inflammation and an enlarged gingival epithelium. The degrees of inflammation, fibrosis, and cellularity depend on the duration, dose, and identity of the drug, on the quality of oral hygiene, and on individual susceptibility that stems from genetic factors and environmental influences. Many professors regard the importance of gingival overgrowth as a clinical problem, and highlights recent advances in the identification of molecular and cellular processes that are leading to an enhanced understanding of the biological mechanisms underlying the overgrowth. Many recent genetic studies on hereditary gingival fibromatosis are beginning to identify the unique cell biology and extracellular matrix metabolism that occur in human gingiva. Dose-dependent correlations with the severity of gingival overgrowth are weak, but decreased drug use in general results in reduced severity of gingival pathology. For example, phenytoin was reported to effuse into crevicular fluid without any correlation to the incidence of overgrowth ,while no direct link was shown between overgrowth and the concentrations of phenytoin and metabolites . A more recent study supports a correlation between diminished metabolism of phenytoin in affected individuals and overgrowth, but this has not been confirmed. Age, gender, concomitant medication with multiple drugs, local factors such as plaque accumulation, and genetic disposition are additional complicating risk factors in drug-induced gingival overgrowth . Therapy of drug-induced gingival overgrowth would seem to be most simply accomplished by the use of alternate medications that do not induce gingival overgrowth, and new medications are under development. At this time, however, older medications are still in active use. Cyclosporin A, for example, increases the rates of survival of most organ transplant patients, although the more recently developed immunosuppressant FK506 (tacrolimus) can be substituted in some patients . Tacrolimus has not yet been associated with gingival overgrowth, but does cause other side-effects that are important for some patients. The literature on the effective substitution of cyclosporin A with tacrolimus is relatively new. Cyclosporin A continues to be the most commonly prescribed drug for the prevention of graft rejection. Similarly, although several new anti-seizure drugs have been introduced and its prescription is markedly reduced, phenytoin remains the drug of choice for certain types of grand mal epileptic seizures . Finally, although hypertension cases are now being treated by alternative calcium-channel-blockers that either do not predictably cause gingival overgrowth or are linked to isolated cases of gingival pathologies, nifedipine remains a highly effective agent in the management of patients who do not respond sufficiently well to other anti-hypertensive medications .In summary, it should be anticipated that drug-induced gingival overgrowth will continue to be a problem until safe and equally reliable medications to control these systemic conditions are developed and fully utilized. In addition, because the administration of these medications in general is beyond the control of the dental professional, clinical management of the gingival overgrowth presents a continuous challenge. Treatment of the gingival overgrowth lesion itself can be complicated due to the superimposed inflammation on the fibrotic tissue enlargement. Traditionally, periodontal therapy offers removal of the inflammatory component of the overgrowth through scaling and gingival curettage, followed by excision of the overgrown gingiva . For patients with severe gingival overgrowth and who require continuous drug therapy for medical reasons, gingivectomy must be repeated periodically due to the recurrent nature of drug-induced gingival overgrowth . Studies on the direct effects of phenytoin , nifedipine , and cyclosporin A on collagenous and non-collagenous extracellular matrix metabolism by gingival fibroblasts in culture have provided variable results. The differences in these investigations depend in part on culture conditions . While cyclosporin A was found to increase glycosaminoglycan secretion by fibroblasts , and nifedipine and phenytoin increased heparan levels ,other studies failed to report any differences in vivo . Several studies demonstrate that these drugs inhibit gingival fibroblast extracellular matrix production and/or cell proliferation in vitro. These findings are inconsistent with the in vivo characteristics of drug-induced gingival overgrowth. Taken together, these studies support the conclusion that direct regulation of extracellular matrix metabolism or proliferation of gingival fibroblasts by these drugs is probably not the primary mechanism responsible for gingival overgrowth. As noted below, deregulated cytokine balances may contribute more significantly to the development and maintenance of gingival overgrowth. Several studies more consistently show that cultured human gingival fibroblasts treated with phenytoin, cyclosporin A, and nifedipine increase production of fibroblast cytokines and prostaglandin E2 ,although lymphocytes and macrophages may be important sources of these factors in vivo (Modéer et al., 1989; Zebroski EJ, Singer DL, Brunka JR. Cyclosporin A, nifedipine and phenytoin: comparative effects on gingival fibroblast metabolism. J Dent Res 1986). Gingival tissues are generally in a state of injury and repair that involves repetitive cycles of production of chemotactic factors, inflammatory cell recruitment, and tissue resorption, replacement, and remodeling . Collagen turnover is unusually high in periodontal tissues .Wound healing and connective tissue turnover are largely controlled by chemokines and cytokines secreted by inflammatory cells such as macrophages and lymphocytes and, to a lesser degree, by fibroblasts. Proliferation and differentiation of connective tissue cells and production of extracellular matrix are controlled by cytokines that initiate signaling cascades mediated by specific receptors. In addition, extracellular matrix elements interact with cell-surface receptors, including integrins, that initiate or modulate signaling cascades .Recent studies demonstrate abnormally high levels of specific cytokines in gingival overgrowth tissues. These findings are of great interest, and suggest that substances that cause gingival overgrowth may do so by altering the normal balance of cytokines in gingival tissues. Cytokines and growth factors found at elevated levels in human drug-induced gingival overgrowth include interleukin-6 (IL-6), IL-1β, platelet-derived growth factor-B (PDGF-B), fibroblast growth factor-2 (FGF-2), transforming growth factor-β (TGF-β), and connective tissue growth factor CTGF. There is a limited understanding of the mechanisms by which altered cytokine balances occur in drug-induced gingival overgrowth. A contributing factor may stem from immunomodulatory effects of the drugs. For example, the increased expression of the macrophage phenotype marker RM3/1 in phenytoin-induced gingival overgrowth is consistent with fibroproliferative disease . In contrast, macrophages in highly inflamed tissues express predominantly the 27E10 marker . Even though IL-1β levels have not been shown to be increased in cyclosporin-A-treated monocytes/macrophages, there was a significant up-regulation in PDGF-B in response to cyclosporin A and phenytoin. Similarly, phenytoin, cyclosporin A, and nifedipine gingival overgrowth tissues contain subpopulations of macrophages and other inflammatory cells that differ from those in healthy control gingival tissues. Studies on T- and B-lymphocytes showed that T-cells are increased in the peripheral blood of organ transplant patients with no apparent shift of subpopulations and nifedipine increased lymphocyte counts in blood , although these findings were not found in gingival tissues . A reduction in the number of Langerhans cells in nifedipine and cyclosporin A gingival overgrowth occurs and suggests a modification of an inflammatory reaction that influences the level of helper T-lymphocytes and cytokine profiles. Inflammatory cell populations that are altered as a result of drug therapy are likely to modify the gingival tissue response. At this time, however, there is no consensus regarding functional relationships between and among drug therapies, the distribution of specific immune system cell subpopulations, and altered cytokine balances. The occurrence of abnormal cytokine levels does not alone prove a functional relationship to gingival overgrowth. Studies have begun to investigate functional relationships between cytokines and gingival extracellular matrix metabolism. These studies seem likely to result in a greater understanding of the biological mechanisms that may be unique to human gingival tissues and may be relevant to the development of therapeutic strategies for either the prevention or treatment of gingival overgrowth. TGF-β1 is a cytokine secreted by many cell types, including macrophages, and it has an important regulatory function in collagen metabolism in connective tissues. TGF-β1 slowly stimulates collagen and lysyl oxidase biosynthesis in early-passage human gingival fibroblast cell cultures , whereas IL-1β, IL-6, and PDGF-BB have little or no effect, and FGF-2 is inhibitory . In contrast, PDGF-BB and FGF-2 are potent mitogenic factors and contribute to the proliferation of gingival connective tissue and epithelial cells. The effects of TGF-β1 on gingival collagen and lysyl oxidase regulation are notable because the magnitude and kinetics of regulation are unexpectedly smaller and slower compared with studies on other connective tissue cells performed under the same conditions . To understand the unexpectedly slow kinetics of TGF-β1 on extracellular matrix synthesis in gingival fibroblasts, investigators in recent studies have focused on the presence and role of connective tissue growth factor (CTGF) as a possible matrix-stimulatory factor downstream of TGF-β1 in gingival overgrowth tissues. CTGF has been proposed to mediate the effects of TGF-β on extracellular matrix metabolism .Before studies performed in gingival cells and tissues are summarized, information on CTGF and the emerging related CCN family of factors is first offered as background information. CTGF is found to occur at elevated levels in a variety of fibrotic pathologies, including the fibrous stroma of mammary tumors , chronic pancreatitis , cataract formation , nephropathy, systemic sclerosis , pulmonary fibrosis , inflammatory bowel disease , bladder fibrosis due to outlet obstruction , brain fibrosis following injury , atherosclerosis , and fibrotic skin disorders . CTGF alone does not promote fibrosis. This is illustrated by experiments in which the simultaneous application of CTGF and TGF-β1 is required for sustained skin fibrosis; neither factor alone was effective . CTGF is rapidly and potently induced by TGF-β1 in fibroblastic cells from a variety of different tissues, and contributes to the regulation of extracellular matrix genes . CTGF contributes to fibrosis in many different tissues. The hypothesis was developed that CTGF could play a role in gingival overgrowth and fibrosis. Studies of CTGF regulation were initiated in vitro in human gingival fibroblast cultures, because increased collagen and lysyl oxidase biosynthesis induced by TGF-β1 occurred only at modest levels and with slow kinetics compared with effects seen in other cell types. The working hypothesis was that TGF-β1 might induce CTGF, which in turn would stimulate extracellular matrix production in gingival fibroblasts. Findings indicate that CTGF is rapidly and potently up-regulated by TGF-β1, and that CTGF stimulates insoluble collagen accumulation in human gingival fibroblast cultures . Moreover, a clinical study indicates that CTGF is present at elevated levels in phenytoin- and nifedipine-induced gingival overgrowth tissues, but not in cyclosporin-A-stimulated gingival overgrowth . The finding of elevated CTGF in phenytoin-induced gingival overgrowth was obvious and clear, even after adjustment for the level of inflammation determined by histomorphometric analyses . This study furthermore indicates that the more fibrotic tissues appear to contain the highest levels of CTGF. Analysis of the data obtained supports the notion that cyclosporin-A-induced gingival overgrowth tissues are significantly more inflamed and less fibrotic than phenytoin- or nifedipine-induced gingival overgrowth. Taken together, these findings identify clear and consistent molecular and cellular distinctions between and among phenytoin-, nifedipine-, and cyclosporin-A-induced gingival overgrowth tissues. It is apparent that gingival overgrowth is a clinical phenomenon that is heterogeneous with respect to the underlying biological mechanisms. Future studies will be necessary to identify additional molecular markers unique to specific forms of gingival overgrowth that will likely prove to be of functional significance in the etiology of different forms of this condition. Drug-induced gingival overgrowth is a side-effect and unwanted outcome of systemic medication and is limited to gingival tissues. Drug-induced gingival overgrowth does not originate in the periodontium, but it occurs exclusively in periodontal tissues and is generally not of the same magnitude in other tissues. Patients who receive anti-epileptic therapy through the systemic use of phenytoin (diphenylhydantoin or DilantinÃÂÃÂ®), or immunosuppressive therapy with systemic cyclosporin A ,or anti-hypertensive treatment with systemic nifedipine develop gingival overgrowth with various degrees of prevalence. While the incidence of this side-effect can be as high as 65% in epileptics, 70% in transplant patients, and 30% in hypertension subjects, variation exists in the reported prevalence and severity of the clinical problem. 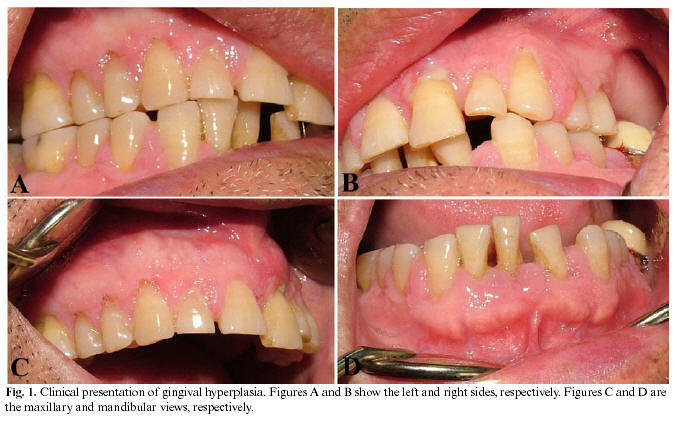 Clinical and histological characteristics of drug-induced gingival overgrowth include hyperplasia in junctional epithelium and hypertrophy in keratinized epithelium and excessive connective tissue accumulation. My classmate Marco and me , have decided to place a particular emphasis on communicating a proper perspective regarding the direct effects of phenytoin, nifedipine, and cyclosporin A on collagenous and non-collagenous extracellular matrix metabolism by gingival fibroblasts in culture,which have provided variable results . The differences in these investigations depend in part on culture conditions. While cyclosporin A was found to increase glycosaminoglycan secretion by fibroblasts ,and nifedipine and phenytoin increased heparan levels , other studies failed to report any differences in vivo . Several studies demonstrate that these drugs inhibit gingival fibroblast extracellular matrix production and/or cell proliferation in vitro. These findings are inconsistent with the in vivo characteristics of drug-induced gingival overgrowth. Taken together, these studies support the conclusion that direct regulation of extracellular matrix metabolism or proliferation of gingival fibroblasts by these drugs is probably not the primary mechanism responsible for gingival overgrowth. Deregulated cytokine balances may contribute more significantly to the development and maintenance of gingival overgrowth. Several studies more consistently show that cultured human gingival fibroblasts treated with phenytoin, cyclosporin A, and nifedipine increase production of fibroblast cytokines and prostaglandin E2 ,although lymphocytes and macrophages may be important sources of these factors in vivo (Comprehensive dermatologic drug therapy, Wolverton, 2000). Gingival tissues are generally in a state of injury and repair that involves repetitive cycles of production of chemotactic factors, inflammatory cell recruitment, and tissue resorption, replacement, and remodeling . Collagen turnover is unusually high in periodontal tissues . Wound healing and connective tissue turnover are largely controlled by chemokines and cytokines secreted by inflammatory cells such as macrophages and lymphocytes and, to a lesser degree, by fibroblasts. Proliferation and differentiation of connective tissue cells and production of extracellular matrix are controlled by cytokines that initiate signaling cascades mediated by specific receptors. In addition, extracellular matrix elements interact with cell-surface receptors, including integrins, that initiate or modulate signaling cascades(Comprehensive dermatologic drug therapy, Wolverton, 2000). Recent studies demonstrate abnormally high levels of specific cytokines in gingival overgrowth tissues. These findings are of great interest, and suggest that substances that cause gingival overgrowth may do so by altering the normal balance of cytokines in gingival tissues. Cytokines and growth factors found at elevated levels in human drug-induced gingival overgrowth include interleukin-6 (IL-6), IL-1ÃÂÃÂ², platelet-derived growth factor-B (PDGF-B), fibroblast growth factor-2 (FGF-2), transforming growth factor-ÃÂÃÂ² (TGF-ÃÂÃÂ²), and connective tissue growth factor (CTGF). There is a limited understanding of the mechanisms by which altered cytokine balances occur in drug-induced gingival overgrowth. A contributing factor may stem from immunomodulatory effects of the drugs. For example, the increased expression of the macrophage phenotype marker RM3/1 in phenytoin-induced gingival overgrowth is consistent with fibroproliferative disease In contrast, macrophages in highly inflamed tissues express predominantly the 27E10 marker). Even though IL-1ÃÂÃÂ² levels have not been shown to be increased in cyclosporin-A-treated monocytes/macrophages, there was a significant up-regulation in PDGF-B in response to cyclosporin A and phenytoin (Bundugas,1999). Similarly, phenytoin, cyclosporin A, and nifedipine gingival overgrowth tissues contain subpopulations of macrophages and other inflammatory cells that differ from those in healthy control gingival tissues(Da Silva,1998). Studies on T- and B-lymphocytes showed that T-cells are increased in the peripheral blood of organ transplant patients with no apparent shift of subpopulations and nifedipine increased lymphocyte counts in blood although these findings were not found in gingival tissues .A reduction in the number of Langerhans cells in nifedipine and cyclosporin A gingival overgrowth occurs and suggests a modification of an inflammatory reaction that influences the level of helper T-lymphocytes and cytokine profiles .Inflammatory cell populations that are altered as a result of drug therapy are likely to modify the gingival tissue response. At this time, however, there is no consensus regarding functional relationships between and among drug therapies, the distribution of specific immune system cell subpopulations, and altered cytokine balances (Simpson,2003). The occurrence of abnormal cytokine levels does not alone prove a functional relationship to gingival overgrowth. Studies have begun to investigate functional relationships between cytokines and gingival extracellular matrix metabolism. These studies seem likely to result in a greater understanding of the biological mechanisms that may be unique to human gingival tissues and may be relevant to the development of therapeutic strategies for either the prevention or treatment of gingival overgrowth. TGF-ÃÂÃÂ²1 is a cytokine secreted by many cell types, including macrophages, and it has an important regulatory function in collagen metabolism in connective tissues. TGF-ÃÂÃÂ²1 slowly stimulates collagen and lysyl oxidase biosynthesis in early-passage human gingival fibroblast cell cultures whereas IL-1ÃÂÃÂ², IL-6, and PDGF-BB have little or no effect, and FGF-2 is inhibitory. In contrast, PDGF-BB and FGF-2 are potent mitogenic factors and contribute to the proliferation of gingival connective tissue and epithelial cells. The effects of TGF-ÃÂÃÂ²1 on gingival collagen and lysyl oxidase regulation are notable because the magnitude and kinetics of regulation are unexpectedly smaller and slower compared with studies on other connective tissue cells performed under the same conditions (Luis Fabiano et al.,1989) . To understand the unexpectedly slow kinetics of TGF-ÃÂÃÂ²1 on extracellular matrix synthesis in gingival fibroblasts, investigators in recent studies have focused on the presence and role of connective tissue growth factor (CTGF) as a possible matrix-stimulatory factor downstream of TGF-ÃÂÃÂ²1 in gingival overgrowth tissues. CTGF has been proposed to mediate the effects of TGF-ÃÂÃÂ² on extracellular matrix metabolism .Before studies performed in gingival cells and tissues are summarized, information on CTGF and the emerging related CCN family of factors is first offered as background information. CTGF contributes to fibrosis in many different tissues. The hypothesis was developed that CTGF could play a role in gingival overgrowth and fibrosis. Studies of CTGF regulation were initiated in vitro in human gingival fibroblast cultures, because increased collagen and lysyl oxidase biosynthesis induced by TGF-ÃÂÃÂ²1 occurred only at modest levels and with slow kinetics compared with effects seen in other cell types. The working hypothesis was that TGF-ÃÂÃÂ²1 might induce CTGF, which in turn would stimulate extracellular matrix production in gingival fibroblasts. Findings indicate that CTGF is rapidly and potently up-regulated by TGF-ÃÂÃÂ²1, and that CTGF stimulates insoluble collagen accumulation in human gingival fibroblast cultures . Moreover, a clinical study indicates that CTGF is present at elevated levels in phenytoin- and nifedipine-induced gingival overgrowth tissues, but not in cyclosporin-A-stimulated gingival overgrowth . The finding of elevated CTGF in phenytoin-induced gingival overgrowth was obvious and clear, even after adjustment for the level of inflammation determined by histomorphometric analyses . This study furthermore indicates that the more fibrotic tissues appear to contain the highest levels of CTGF. Analysis of the data obtained supports the notion that cyclosporin-A-induced gingival overgrowth tissues are significantly more inflamed and less fibrotic than phenytoin- or nifedipine-induced gingival overgrowth. Taken together, these findings identify clear and consistent molecular and cellular distinctions between and among phenytoin-, nifedipine-, and cyclosporin-A-induced gingival overgrowth tissues .It is apparent that gingival overgrowth is a clinical phenomenon that is heterogeneous with respect to the underlying biological mechanisms. Future studies will be necessary to identify additional molecular markers unique to specific forms of gingival overgrowth that will likely prove to be of functional significance in the etiology of different forms of this condition. The mechanisms by which CTGF promotes fibrosis are being investigated by several different laboratories. There is no evidence for a specific unique dedicated CTGF signaling receptor in fibroblasts, and as noted, there is evidence for CTGF/integrin interaction with functional consequences (Da Silva,1985). It is interesting that immunohistochemistry/immunocytochemistry studies suggest the presence of CTGF both in the extracellular matrix and within cells . Thus, intracellular CTGF could potentially have function. A possible role in the inhibition of cell-cycle progression by intracellular CTGF has been suggested. NOV, another CCN family member, likely has extracellular and intracellular functions. It binds to the extracellular matrix protein fibulin and is proposed to participate in extracellular matrix deposition and cell adhesion . In some respects, it is surprising that CTGF is elevated in phenytoin-induced gingival overgrowth tissues. In human and rodent fibroblast cell lines, PGE2 is a potent and rapid down-regulator of CTGF, and this effect is mediated by elevated cAMP levels. Phenytoin stimulates prostaglandin E2 (PGE2) production by gingival fibroblasts, and it is well-known that human gingival tissues accumulate significant levels of prostaglandins including PGE2 . The fact that CTGF is elevated in phenytoin-induced gingival overgrowth tissues, therefore, is unexpected and raises the notion that human gingival tissues may be metabolically unique in their response to PGE2. The effects of PGE2 on fibroblasts are mediated principally by four receptors, EP1-EP4 PGE2 stimulation of cAMP levels is mediated primarily by the EP2 receptor .Future studies will determine which PGE2 receptors are expressed by gingival fibroblasts, and whether phenytoin regulates either the function or the expression of prostaglandin receptors in gingiva in novel ways. It is very interesting to note that other recent studies support the notion that gingival fibroblast extracellular matrix metabolism has unique aspects. In healing adult human gingiva, MMP-13, and not MMP-1, is highly expressed by gingival fibroblasts. In contrast, MMP-1 is predominantly expressed in adult dermal wounds. Moreover, MMP-13 is strongly up-regulated by TGF-ÃÂÃÂ²1 in human gingival fibroblasts, but is down-regulated in human dermal fibroblasts grown under the same conditions . MMP-13 is a collagenase with wide substrate specificity, whereas MMP-1 is a collagenase more restricted to hydrolyzing fibrillar collagens. Differential regulation of these two MMP genes is likely to be of biological importance, and may be related to the generally lower tendency for scar formation in oral tissues .In addition, integrin expression patterns differ between gingival fibroblasts and dermal fibroblasts, whereas periodontal ligament fibroblasts and gingival fibroblasts are more similar to each other in this respect . It is interesting to note that human gingival fibroblasts and periodontal ligament fibroblasts express a variety of different genes differentially, including members of the CCN family of genes . Unique aspects of gingival fibroblast extracellular matrix metabolism seem likely to contribute to the etiology of gingival overgrowth. In addition, metabolic uniqueness of gingival cells may help explain the striking tissue specificity of drug-induced gingival overgrowth. Cyclosporin-A-induced gingival overgrowth is an interesting example of tissue-specific mechanisms that are not fully understood at this time. A major and serious side-effect of cyclosporin A therapy is kidney fibrosis, which can result in kidney failure .Cyclosporin A stimulates levels of circulating TGF-ÃÂÃÂ² in vivo, and enhances TGF-ÃÂÃÂ² production by renal cells and lymphocytes. This results in increased collagenous extracellular matrix synthesis and deposition in the glomeruli of the kidney, as demonstrated by studies with anti-TGF-ÃÂÃÂ²1 antibodies that block renal fibrosis and renal dysfunction. Taken together, these studies suggest that cyclosporin A stimulates TGF-ÃÂÃÂ² production that, in turn, leads to kidney fibrosis and nephropathy. Based on these findings, it seemed reasonable to expect that TGF-ÃÂÃÂ²1 and its downstream target CTGF would be expressed at high levels in cyclosporin-induced gingival overgrowth. Contrary to these expectations, cyclosporin-induced gingival overgrowth tissues are highly inflamed, do not express high levels of TGF-ÃÂÃÂ² or CTGF, and are not the most fibrotic tissues. These findings are surprising and indicate that oral bacteria and gingival cells and tissues must interact in unique ways in subjects receiving cyclosporin A that results in relatively greater inflammation and cellularity compared with other forms of gingival overgrowth. The biological mechanisms responsible for this phenomenon must be unique to gingival tissues and cells and are currently under investigation. Gingival overgrowth or enlargement, the currently accepted terminology for an increase in the size of the gingiva, is a common feature of gingival disease. Gingival enlargement can be caused by a number of various stimuli, and "treatment is based on an understanding of the cause and underlying pathologic changes. difficulty eating, pus coming from the gums, teeth becoming loose, teeth falling out, and abscesses (collection of infected fluid) on your gums. Gingivitis can usually be diagnosed from our own symptoms alone and, in most cases,we will not require any tests or procedures to confirm uour dentist's diagnosis. If your doctor suspects that we have gingivitis and periodontitis, they will refer us to a specialist. Gingival overgrowth may be caused by a multitude of causes. The most common is chronic inflammatory gingival enlargement, when the gingiva presents clinically as soft and discolored. This is caused by tissue edema and infective cellular infiltration caused by prolonged exposure tobacterial plaque, and is treated with conventional periodontal treatment, such as scaling and root planing. 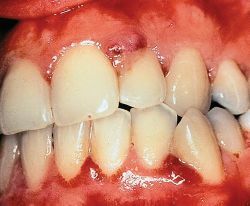 Situations in which the chronic inflammatory gingival enlargement include significant fibrotic components that do not respond to and undergo shrinkage when exposed to scaling and root planing are treated with surgical removal of the excess tissue, most often with a procedure known as gingivectomy. Gingivitis and gingival enlargement are often seen in mouth breathers as a result of irritation brought on by surface dehydration, but the manner in which it is caused has not been demonstrated. isradipidine can replace nifedipine and does not induce gingival overgrowth.